If you want to grow your business, you need to generate qualified leads. Without leads to nurture into customers, your sales will not grow. And that’s the whole point of your business, isn’t it? 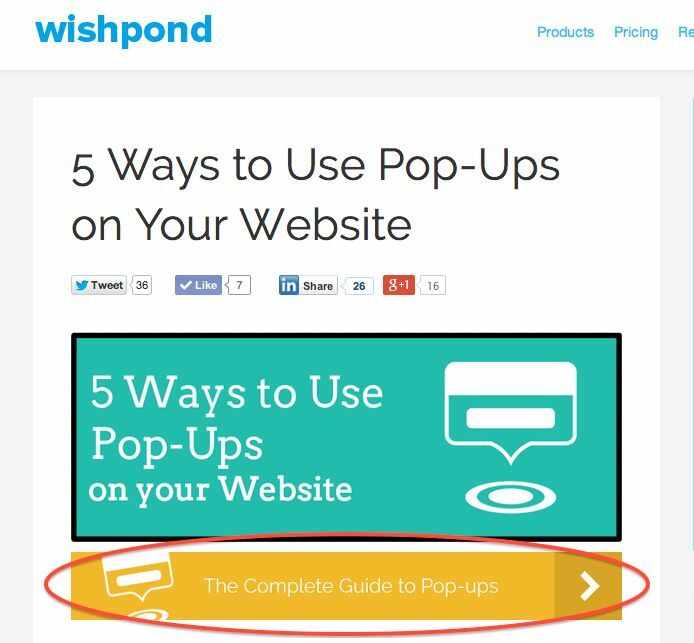 If you are a loyal reader of the Wishpond blog, you’ve read my first four articles on the five types of lead generating popups: exit popups, entry popups, timed popups and scroll pop-ups. Today, I’m going to introduce you to a new lead generation website popup. In this article, I’m going to show you three click popup examples from successful innovative businesses. 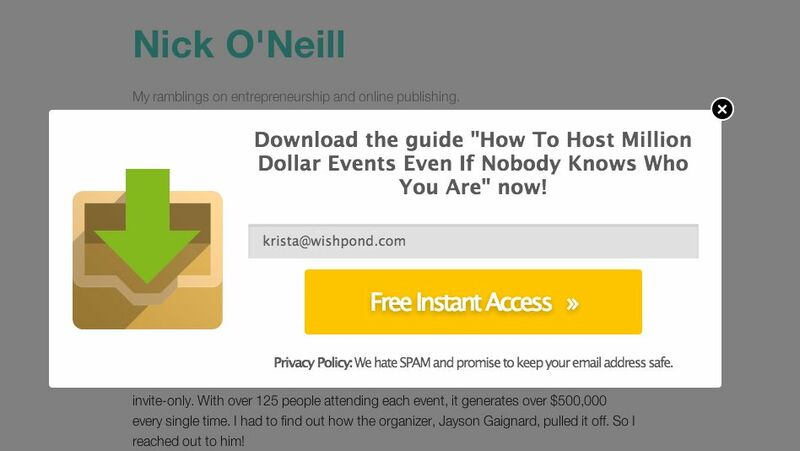 I’ll break down their tactics to show you how to best use these pop-ups to generate leads and start building your own email list. What is a Click Popup? A click popup is a type of popup that’s activated only when a website visitor clicks on your campaign text or image. After they’ve taken that action with you, your offer shows up so they can act with you again. They tend to have a high conversion rate, because your visitor has to first take the action of clicking on your offer. In other words, click popups tend to get you qualified leads directly from highly interested traffic on your website. A click pop-up is sort of like a combination of a landing page and a more traditional lead generating popup (such as an exit popup, entry popup, timed popup or scroll popup). They speed up the process of getting your potential prospect converted - without the additional step of being redirected to a new page within your site. Click popups aren’t really new. You’ve seen and used them - even if you haven’t run the click pop-ups yourself. Many ecommerce sites have been using click popups as a product page, or to give more information about a product - without having to leave the page viewers were on. What is new is how they’re starting to be used - as lead generators. Amazon, for example, uses click popups to show video product information for the new Amazon Fire TV. 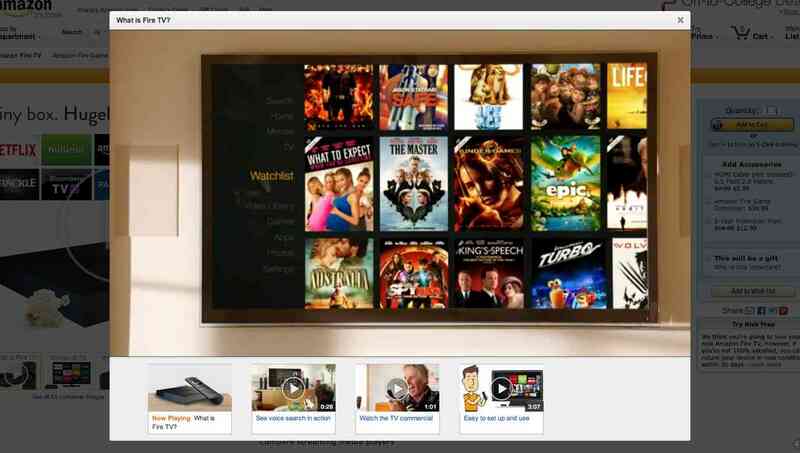 When you click on on the Fire TV image, a video pops up marketing the system. Ready to take your online marketing to the next level? Let’s take at look at three successful online businesses who are already using click popups. I’ll show you how they do it and how you can use the tips to start building your email list too. 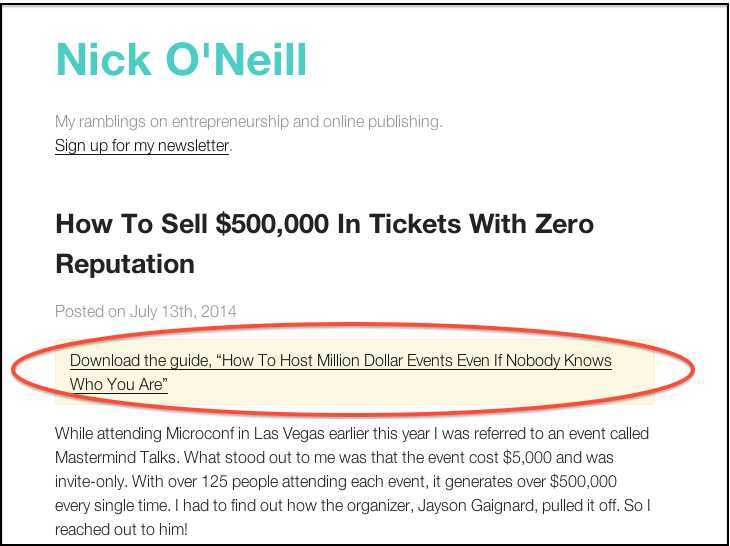 Nick O’Neill is a successful entrepreneur and podcaster. He blogs about business and online publishing, mostly through podcast interviews. The clickable text has a clear Call to Action (CTA) using the actionable verb “download”, and states the name of the guide, so interested viewers know what they will get when they take the action to click. The popup image is a clean, simple, natural toned flat icon that gives a friendly feel. It’s relevant to the offer. The pop-up headline matches the CTA text exactly, so readers will trust the popup thus increasing conversions. The popup CTA is large, with a contrasting yellow color. It invokes a quick action by using the time based term “instant” and including two small arrows to make it look like fast action. I’ll give bonus points for having auto-fill form fields. This advanced tactic increases conversions by lowering the barrier to entry. As you can see, the pop-up auto-fills a visitors email, so all a reader has to do is click on the CTA button to get the offer. There are no additional benefits given for downloading the book. It should include at least one reason or selling feature to entice clickers to convert, such as “read the story of how Jayson Gaignard created mastermind talks”. Don’t use the word “spam” in your email subscriptions. If you can sell the benefits of giving your email, your readers are not even thinking about spam - until you mention it. We’ve A/B tested this on multiple CTAs of our own, and every time the result is unequivocally the same - conversions decrease when we include “spam” in the copy. The Smart Passive Income Blog is a website by Pat Flynn who writes about making money online. He practises what he preaches and has real experience using the most effective lead generation strategies. The clickable CTA is visually appealing with a color contrasting green “get started” button. The design on both the CTA and the click popup is consistent. 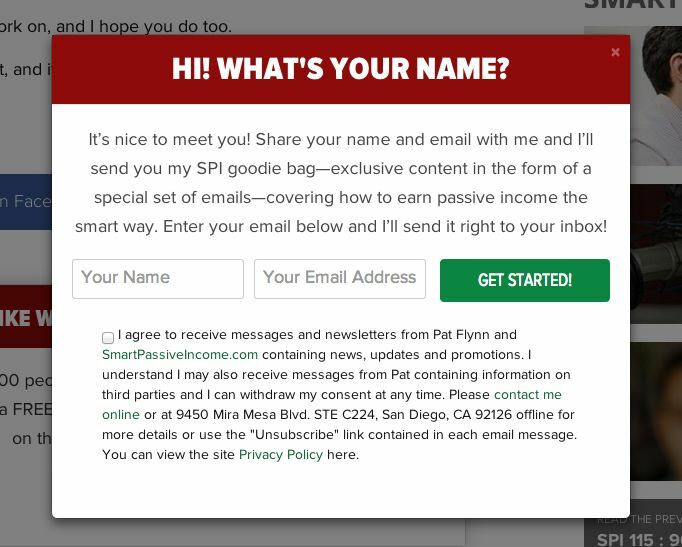 As discussed above, a matching CTA and click popup instill trust (and confidence) in readers to convert further. The copy is very personable, written in first and second person pronouns (“you” and “me”), which makes the visitor feel they the offer is from a real person and potential friend (even the form fields include “your”). The offer to receive exclusive weekly email newsletters is enhanced by also giving away a free copy of an ebook. The headlines are questions which (subconsciously or not) invoke engagement and motivate further actions and conversions. The popup is a bit wordy and in paragraph form. He could shorten his benefits, put them in a list form, or even include more visuals, like his face or the cover of his ebook he’s giving away for free to generate more interest and conversions. The agreement check box is also too wordy. With seven lines of consent, including the agreement to receive messages about third parties. It’s good that he’s upfront about his intentions, but selling about third parties would definitely lower the pop-up conversion rate. Wishpond is a leading online marketing tool provider. We make it super easy to create comprehensive online marketing campaigns - from lead-generation website popups, landing pages and social promotions, online ads, A/B testing, analytics and lots more. The Wishpond blog (uh, what you’re reading right now) gives you awesome tips on current online marketing strategies (well, I think so…). Okay, enough self-promotion, right? I’ve got to say, I don’t normally use our own examples for critique articles. I way prefer to give you case studies and samples from other really cool companies doing online marketing right. But, click pop-ups are just so new there’s still not a lot of businesses using them yet. Personally, I see this as an opportunity for you. A lead generating click website popup can show your brand as cutting edge and ahead of the curve. Use them right and you’ll get results too. We’ve seen a 100% increase in leads since we implemented this type of website popup just 3 weeks ago…. The headline copy of the click popup matches the CTA banner copy of “the complete guide to popups”. The more consistently you match your CTA with your popup, the more trust you build. Let’s face it, when you’re asking for a conversion, people don’t like surprises - they want to get what you promised them. The list of benefits is clearly written and designed, with three bulleted checkmarks, and real benefits that solve the problems our customers have. There is only one form field, which reduces the barrier to conversion. And yes, we use the auto-fill form field, so if a visitor has converted with you in the past, our software tracks the user’s browser and automatically fills in the required information. This increases conversions by lowering barriers and increasing the feeling of familiarity (your visitor feels like you already know their name or contact info). 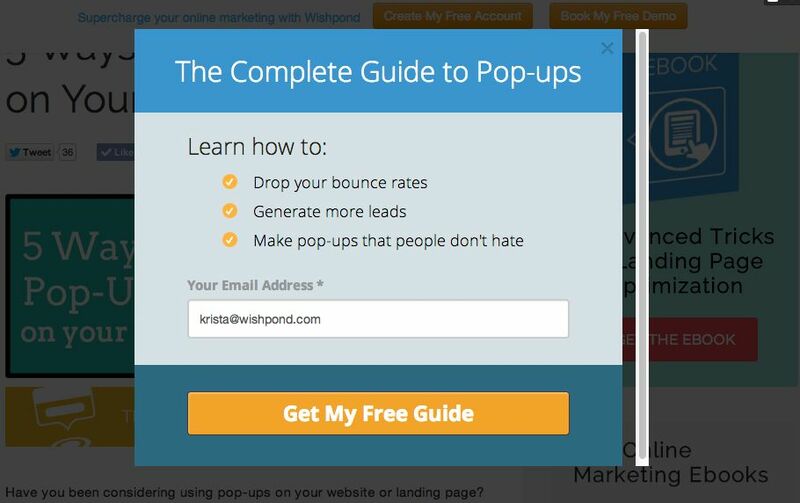 The popup CTA (“get my free guide”) is written in the consumer-centric first person. We’re thinking of how our traffic reads our stuff! We’re constantly A/B testing our popups (and landing pages and everything else). One thing we’re testing right now is the color scheme. I personally like the three shades of blue and the color contrasted orange CTA and list checkmarks. We’ll find out in the next week or so if you do too. If our conversion rates are up, we’ll keep it. If we’re lowering conversions, we’ll try out a louder color scheme. We could also try adding a directional cue, such as an arrow pointing to the CTA. We could try adding an image of the guide itself too, to make it super clear and obvious what it is you’ll be getting. Do you feel like you are ready to take your lead generation to the next level now? I hope you’ll give click website popups a try. Personally, I love them and I think you will too.